What are the most famous American conspiracy theories? Conspiracy theories are often based on an event that people don’t believe has happened this event has or will change history. 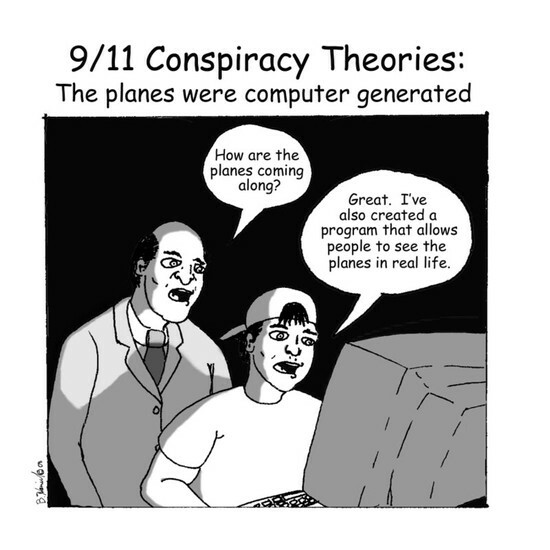 Conspiracy theories range from being a valid possible interpretation of events to the truly bizarre beliefs in an alternative reality. I am going to be looking at three different conspiracy theories 9/11, JFK assassination and the moon landing. These are major events in history that America went through, some good and some bad but the majority of people think that America lied, stole and cheated to get a place in history, whether it was good or bad. Kennedy, the 35th President of the United States, was assassinated at 12:30 p.m. on Friday, November 22, 1963, in Dealey Plaza, Dallas, Texas. Kennedy was fatally shot while traveling with his wife Jacqueline, Texas Governor John Connally and Connally's wife Nellie, in a presidential motorcade. 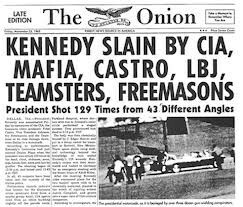 In 1978 people agreed that Kennedy was probably assassinated as a result of a conspiracy. The HSCA stated that there were at least four shots fired (only three of which could be linked to Oswald) and that there was a high probability that two gunmen fired at the President. The Government found out that Lee Harvey Oswald was responsible for the assassination of Kennedy and they didn’t find or believe that there was a second gunman. But some people have argued that the Commission and the government have covered up crucial information pointing to a conspiracy. The UFO Cover-up and the KGB theories were one of the main reasons people thought the Kennedy was killed. The UFO cover up, President Kennedy was assassinated for showing too much interest in alien activity. The two crucial pieces of ‘evidence’ in this situation is a letter written by JFK to the CIA in which he demands to see secret UFO files; and a note from the CIA director that says, “As you must know, Kennedy has made some inquiries regarding our activities, which we cannot allow.” The KGB also had good reason to kill Kennedy because of the1962 Cuban Missile Crisis. Some researchers also believe that the KGB was responsible for the death of one of JFK’s Girl friend Mary Pinchot Meyer, who may have been able to expose their hand in the assassination. 9/11 happened on September 11th, 2001, it was a terrorist attack on the pentagon, the twin towers and the world trade centre. There were four planes two hit the twin towers and the other was meant to hit the pentagon but crashed in to a nearby field instead. The 9/11 Commission Report states that "the 9/11 attacks were a shock, but they should not have come as a surprise. Islamic extremists had given plenty of warnings that they meant to kill Americans indiscriminately and in large numbers. The terrorist behind it were from al-Qaeda, and 15 of the 19 were citizens of Saudi Arabia. The others terrorists were from Egypt, Lebanon, and the UAE. The hijackers were organized into four teams, each led by a pilot-trained hijacker with four other hijackers who were trained to help stop the pilots, passengers, and crew finding out what they were doing on the days leading up to the 9/11, two airlines saw a rise in their put to call ratio. These two air lines were United Airlines and America Airlines, the two airlines whose planes were hijacked on the day of 9/11. The twin towers look like the result of a controlled demolition rather than structural failure due to impact and fire. They think that the authorities within the government had advance foreknowledge of the attacks and deliberately ignored what they knew and that helped the attackers blow up the twin towers. Some people also say that key individuals within the government planned the attacks and collaborated with, or framed, al-Qaeda in carrying them out. People have lots of different opinions about how this might have been achieved. This is because America wanted to start a war with the Pakistan’s to use their resources such as oil and other fossil fuels. The world trade centre in the twin towers collapse at the North Tower, and the South Tower. But some sources say that the 7 World Trade Centre was caused by explosives installed in the buildings in advance. There is proof of it being an controlled explosion because there was molten steel found in the rubble was evidence of explosives, as an ordinary airplane fire would not generate enough heat to produce this. An investigations went under way shortly after the attacks there was an unusually large numbers of shares in insurance companies and airlines sold off before the attack, in the UK, Italy, Germany, Japan, Switzerland, France and the US. News accounts in the weeks that followed reported a notable pattern of trading in the options of United and American Airlines. This shows that the government was helping the terrorists by using the world trade centre even though they knew they were going to blow it up and they were going to kill thousands of citizens. The U.S. administration deliberately chose not to shoot down a plane that was heading for the Pentagon but no plane hit the Pentagon at all. They say one of the reasons that the plane never got to the pentagon was that something went wrong with the bombs that were meant to be hidden inside. Either they didn’t have enough time to install the bombs or someone caught them and stopped so they purposely aborted the mission. The conspiracy theory to the reason why they didn’t want to crash in to the pentagon was because the bombs would make sure that everything would be destroyed and none of the people who knew about what they were doing would die and not be able to give any evidence of what happen. People don’t really understand why they would kill people who would turn their backs on their own country because they seem like hated America. If the terrorists showed that these people knew what was happening they would have been even more chaos then them blowing up the twin towers. And they wanted to show their religion was better than anybody else’s and they could have got their point across a lot stronger if they did that. That’s one of the mistakes they made; if they wanted to get there point across. They most of known what America was planning to do either that or they where stupid as America was helping them blow up and kill thousands of people or there was an alternative motive behind it. Some conspiracy theories link to the reasons that they wanted to start a fight with Pakistan out of their own greed and need for power; it was selfish act that killed thousands of people, and it still is in Pakistan where soldiers are fighting for something they started. An eye for an eye makes the world blind. And this was for their own petty morally wrong continence. The moon landing happened on 13 September 1959. It was a space race between America Russia. Some of conspiracy theories claim that the Apollo program and the associated Moon landings were hoaxes staged by NASA and members of other organizations. Various groups and individuals have made such conspiracy claims since the mid-1970s. 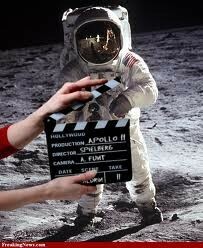 The most famous theories were that they faked astronauts did not walk on the Moon. Conspiracy theorists base their claims that NASA lied to the public into believing the landings happened by manufacturing, destroying, or tampering with evidence; including photos, telemetry tapes, transmissions, rock samples, and even some key witnesses to win the space race.The main reasons why people thought that the America faked going on the moon was the space race, funding and the Vietnamese war. The United States government had to win the Space Race against the Soviet Union. Going to the Moon would be risky and expensive. The main reason for the race to the Moon was the Cold War. Russia and United States wanting to see who was the most powerful they did this by having a completion (the space race) to see who would win overall. If they loss it would be humiliating on Russia would get the upper hand on the war. It is claimed that NASA faked the landings to ensure that it continued to get funding. NASA raised about US$30 billion to go to the Moon, and so people believe that this could have been used to pay off many people. People believed that sending men to the Moon was impossible at the time; they argue that landings had to be faked to fulfill Kennedy’s promises. Others have claimed that, with all the known and unknown hazards, NASA would not have risked the public humiliation of astronauts crashing to their deaths on the Moon, broadcast on live TV. It is claimed that the landings helped the United States government because they were a distraction from the Vietnam War; and manned landings suddenly ended about the same time that the United States ended its role in the Vietnam War. The two main pieces of evidence that made people believe that the moon landings where fake is that the flag that they put into the moon waved even though space is a vacuum and when the astronauts walked they left foot prints on the surface which people think was not right because they would have been heavy enough because of the gravity to make an impact on the surface of the moon. If you want to do about this go to http://dsc.discovery.com/search.htm?terms=mythbusters+moon+landing. I learnt that America does a lot of things out of greed and power if these things are true. I have also learnt that people come up with lots of weird ideas of what could have happened in these events. I also have got more interested in how the 9/11 actually happened and the truth behind what could have happened that day.